You can take more kinds of digital photos when you use a zoom lens. Its range of focal lengths provides you with the flexibility to shoot a wide view, normal view or a closer view of your subject, without having to change lenses. A zoom lens can create an entirely different effect when you zoom or move from one focal length to another, as you release the shutter. Also known as racking the lens, this extends or stretches all the points in your photo, including the subjects or objects, based on how much you zoom the lens during exposure. This technique creates motion in your digital photos and gives them an abstract quality. Photo-editing software will also let you produce this effect, but when you know how to do it while shooting, you’ll discover surprising results as you improve your camera skills. Try the tips below to add this technique to your digital photography toolbox. Select a slower shutter speed. • This could be 1/60th, 1/30th or less, depending on a number of factors, including the amount of light, the focal length range of your zoom lens and any movement within the photo. • Experiment with different shutter speeds, lighting conditions, etc. • Shoot a series of photos at various exposures and you’re more likely to take a winner. • To make sure your exposure is correct at a slower shutter speed, you’ll probably have to adjust your aperture to a larger f-stop, which makes the lens opening smaller. • Read the series of PhotographyTalk.com articles, starting with Digital Photography—Taming the Three-Headed Exposure Monster, Part 1, for more information about the direct relationship between shutter speed and aperture. • This zoom effect requires some practice and patience. • You want a smooth movement from one focal length to another, and it must be at a steady rate. • Again, experiment with different lengths of racking the lens. • A long zoom will extend or stretch the subjects and objects in your digital photos farther. • A short movement will impart just a small amount of this effect. • Shoot different pictures zooming in and zooming out, and compare the results. • Static subjects or objects don’t lend themselves to the zoom effect. It just creates a displeasing and bizarre image. 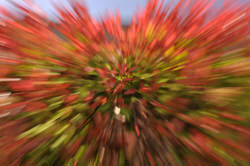 • The zoom effect makes digital photos more dynamic and interesting when it’s applied to subject and objects in motion. A horse, a sprinter or a racing car is a better subject. A colorful setting where people are dancing or performing or a festival or street fair will provide you with much better opportunities to use the rack-the-lens technique. Use the zoom effect sparingly, but when you use it in the right setting with good technique, your digital photos can be spectacular.